A University of Washington team has developed a versatile platform to simultaneously offer contraception and prevent HIV. Electrically spun cloth with nanometer-sized fibers can dissolve to release drugs, providing a platform for cheap, discrete and reversible protection. The research was published this week in the Public Library of Science’s open-access journal PLoS One. The Bill & Melinda Gates Foundation last month awarded the UW researchers almost $1 million to pursue the technology. 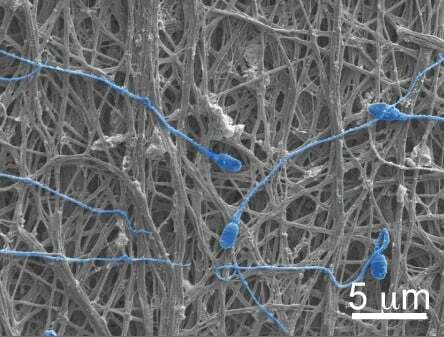 The electrospun fibers can release chemicals or they can physically block sperm, as shown here.